This trend has met considerable resistance by local politicians, resulting in a controversial public debate about whether there should be tighter controls on FDI. For an informed debate on this topic, it is important to understand what kinds of foreign companies multinationals like to own. In the context of global production networks, we see that multinational firms manage global supply networks with hundreds and sometimes thousands of intermediate inputs. They own some of their foreign suppliers, but not others. What determines whether the multinational ‘buys’ a specific input from an independent supplier or ‘makes’ it within its firm boundary? Companies tend to source technologically important inputs – that is, inputs with a higher cost share, from subsidiaries; by contrast, they tend to buy less important inputs from independent suppliers. An important motive for integrating suppliers is that the cost of haggling with suppliers of more important inputs is larger, and the downstream firm tries to curb this cost by bringing the supplier under its control. Should we expect multinationals to outsource to suppliers of their most important inputs, or to integrate them as affiliates? The current literature provides no clear guidance on this question, as one can find arguments for both. For example, the property rights theory (PRT) developed by Grossman and Hart (1986) and Hart and Moore (1990) suggests that the multinationals face stronger incentives to outsource the production of more important inputs to independent suppliers, because they want to limit underinvestment for these crucial inputs (PRT type force). On the other hand, the ‘transaction cost economics’ (TCE) theory of the firm pioneered by Williamson (1985) and Klein et al. (1978) suggests the opposite: multinationals would like to integrate the suppliers of more important inputs in order to reduce costs that arise from haggling over prices or from coordination failure. Overall, it is ex ante unclear how multinationals would behave. In our research, we examine this question empirically. We use detailed data on the imports of French firms in 1999, which allow us to distinguish between imports from affiliated foreign suppliers and imports from unrelated suppliers for detailed individual inputs. We measure the technological importance of each input as its cost share in total expenditure on intermediates. The inputs that French companies import vary widely in their importance, ranging from a cost share close to zero to about 9%. For each input, we also observe the share of intra-firm imports. In Figure 1, we split the inputs of French companies into two groups: one denoting the most important (above median cost share) inputs, and the other the least important (below median). We plot the shares of intra-firm (outsourced and mixed) imports for each group and a clear pattern emerges – firms are more likely to source more important inputs from their affiliates (larger intra-firm import share). How do we interpret this pattern? To fix ideas, imagine a car factory. A modern automobile consists of about 500 components, made of around 30,000 individual pieces which are delivered to a factory and then combined (Klier and Rubinstein 2010 and Wikipedia). A unifying feature that is relevant for each and every item is its contribution to the output product made by a firm. At the component level, for example, an engine contributes significantly more to the costs of a car than a rear-view mirror, regardless of the make or model of the car. Conceptually, in an input-output framework, a dollar's worth of a car relies much more on the contribution of an engine producer than a rear-view mirror supplier. In other words, some inputs are technologically more important than others. Anecdotal evidence suggests that engines are typically produced in-house, while rear-view mirrors are outsourced. This is consistent with our finding that high cost share (i.e. 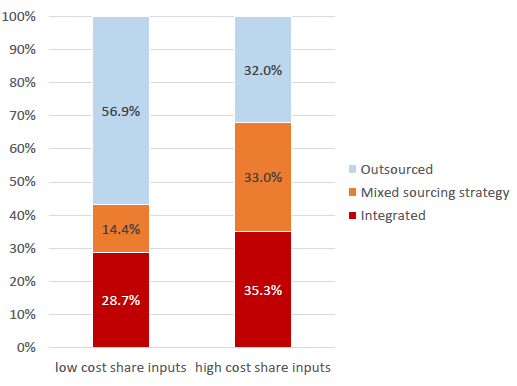 ‘important’) inputs are significantly more likely to be sourced intra-firm. The role of technological importance is economically significant. Our main result is based on a comparison of different products sourced by the same firm and shows that an important input (at the 75th percentile of the cost share distribution) is about 7 percentage points more likely to be sourced in-house than an input that is not very important (at the 25th percentile), which amounts to about one quarter of the overall share of integrated imports. We document that cost shares are at least as important in driving ‘make or buy’ decisions of multinationals as previously studied determinants such as capital intensity, skill intensity, or productivity. Of course, there is reason to believe that the explanation could be the reverse. For example, firms may substitute towards inputs produced by their foreign affiliates because they want to trigger increasing returns for them and maximise global profits. Alternatively, firms in relatively high-tax France may pay higher prices for inputs produced by foreign affiliates in order to reduce artificially their taxable income (e.g. Bernard et al. 2006). We are able to exclude these alternative explanations by focusing on the inherent technological input-output relationship of a detailed industry, rather than cost shares that may be distorted at the firm level. The fact that multinationals typically produce important inputs in-house suggests that their main motive for owning a supplier is to prevent it from haggling over prices and to facilitate coordination. Interestingly, however, sourcing from affiliates is even more likely whenever the provision of an intermediate input is subject to a good contracting environment, contrary to what would be expected in a TCE world (i.e. that if contracts can ensure that suppliers act in line with the multinational’s desires the need for integration would be reduced, rather than reinforced). Similarly, we find that whenever a downstream multinational has to invest a lot in the supply relationship – for example, in the form of dedicated machinery or R&D – technologically important inputs are also more likely to be produced in-house. It is unclear how this empirical pattern can be explained by haggling and coordination alone. How can we make sense of these findings, including the main tendency to vertically integrate important suppliers? We argue that they are in fact quite naturally in line with a world in which TCE-type forces (pushing for integration of important inputs) coexist with and, on average, overpower PRT forces (pushing for outsourcing). When the contracting environment is better or when a multinational’s investments matter more, PRT considerations are less of a concern and important inputs are even more likely to be produced in-house. Multinationals with large and complex production networks have become a dominant feature of today’s economies. But while these supply networks are large, it does not mean that multinationals own every step of the global production chain. Understanding the determinants of the ownership boundaries of multinationals is important since this has implications for how closely the economies of different countries are interconnected. For example, multinationals might transfer knowledge to their subsidiaries but not to independent suppliers; there might be effects on the wages paid to workers, as multinationals tend to pay higher wages than domestic firms; and it might also matter for how economic crises spread to other economies. Our research suggests that policymakers should analyse global production networks specifically in terms of the most important inputs that are used in each production chain. Berlingieri, G, F Pisch and C Steinwender (2018), “Organizing Supply Chains: Input Cost Shares and Vertical Integration”, CEP Discussion Paper 1583. Bernard, A B, J B Jensen, and P K Schott (2006), “Transfer Pricing by U.S.-Based Multinational Firms,” mimeo. Grossman, S J, and O D Hart (1986), “The Costs and Benefits of Ownership: A Theory of Vertical and Lateral Integration”, Journal of Political Economy 94(4): 691-719. Hart, O D and J Moore (1990), “Property Rights and the Nature of the Firm”, Journal of Political Economy 98(6): 1119-58. Klein, B, R G Crawford and A A Alchian (1978), “Vertical Integration, Appropriable Rents, and the Competitive Contracting Process”, Journal of Law and Economics 21(2): 297-326. Klier, T H, and J M Rubinstein (2010), “Measurement Issues Arising From the Growth of Globalization”, Conference Paper. OECD (2015), OECD Science, Technology and Industry Scoreboard 2015: Innovation for growth and society, OECD Publishing. Williamson, O E (1985), The Economic Institutions of Capitalism, The Free Press.